Castlegate II is 260 plus acres that blends unique homebuilders, prime location, strong schools, and one of a kind amenities into one master planned community consisting of over 840 homes. Homeowners seeking uniqueness, quality and value can find the perfect lot to build their home in Castlegate II. Castlegate II residents will enjoy luxurious amenities such as a resort style pool unlike any in our area as well as parks including a fitness park, greenbelts, and a beautiful lake with sprays which is stocked for fishing. Castlegate II has created a community where residents can have a unique lifestyle where they can live, recreate, work and shop. Located in the heart of the expanding South College Station area there is a mix of retail, commercial, schools, hospitality, restaurants, office, medical offices and hospitals all at your fingertips. Choosing a development designed by Wallace and Dusty Phillips will offer homeowners the peace of mind of a responsible development that only many years of experience can provide. Come out and see today why you should call Castlegate II your new home! All architectural plans, including site plans must be submitted prior to construction. Every effort will be made to provide a response within 72 hours of submission. Section 200’s – Minimum two vehicle garage is required. Garage entrance must be recessed five feet from the front of the house or a side entrance garage. Section 100’s - Minimum two vehicle garage is required. See Plat for specific set back requirements. The Castlegate II Owners’ Association annual dues are $600 for homeowners. The dues are primarily for, but not limited to, maintenance of the amenities and common areas, utilities, taxes, insurance, community events and education and other operating expenses as outlined in the CCRs. The HOA is also professionally managed by Neighborhood Partners (a certified HOA management company) and will host a hoa website where all community financials and community events will be posted for residents viewing. Recreational Vehicles and Trash Cans must be kept in the garage or out of view. If not fully screened from view, approval must be obtained from Architectural Control Committee. Any outbuildings must blend with the residence or be completely screened from view and be approved by the Architectural Control Committee. Yards must be fully sodded, irrigated, and landscaped on or before substantial completion of the newly constructed residence. Initial landscape installation must be performed in accordance with the rules and regulations set out by the ACC. 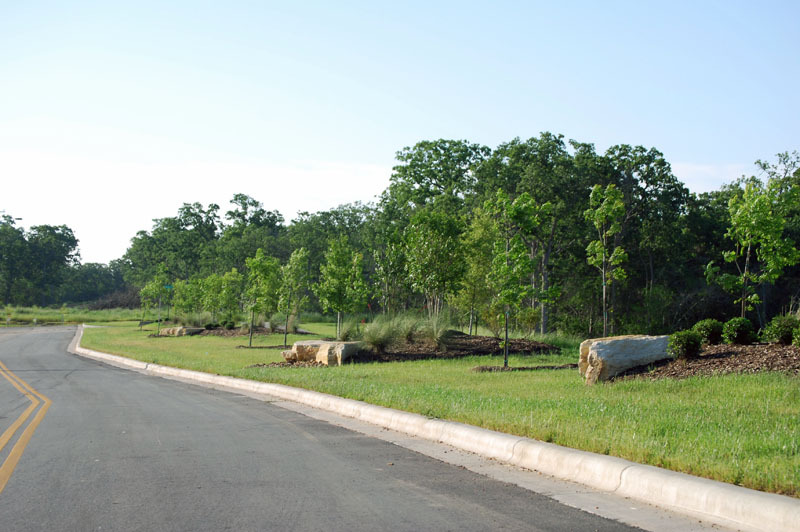 Additionally, lot owners must use either a landscape contractor approved by the ACC or submit a landscape plan to the ACC for approval prior to installation of landscape. A list of approved landscapers and guidelines can be obtained from the HOA office. At all times at least two trees with a minimum two-inch diameter must be maintained in the front yard of any lots in Section 200’s. Section 100’s require a minimum of one, two-inch trees. Any new trees planted by the owner of a lot in the front yard shall be evergreen trees. This does not prohibit planting additional trees that are not evergreen once the minimum requirement is met. Due to regulations with the United States Postal Services, no lot shall have a mailbox. All mailboxes for US mail shall be located at cluster mailbox locations to be designated by the ACC. Keys and addresses will be distributed by the United States Postal Service. Unless otherwise approved by the ACC or as provided below, any fence built or maintained on any Lot shall be constructed only of standard grade 1x6 cedar privacy fence materials with the finished smooth side facing Victoria Drive, WS Phillips Pkwy, all other streets or Common Areas and/or adjoining properties what are not part of Castlegate II Communities, and the rough side facing the interior of the lot. Wrought iron fencing shall be installed on the boundary of any lot within Lots 8-17, block 14, Section 100, Lots 1-8, block 7, Section 200, and Lots 9-14, Block 7, Section 201. The approved iron fencing is manufactured by Ameristar, 1-800-321-8724, Majestic Panels, 3 Rail, 6 feet tail or substantially similar fencing if Ameristar no longer manufacturing Majestic Panel. All information contained herein is from sources deemed to be reliable. However, no warranty or representation is made as to the accuracy thereof. This offering is subject to errors and omissions, changes in price, prior sale or withdrawal without notice. The summary of information contained herein in not intended to replace a thorough review of the declaration of covenants, conditions and restrictions and any recorded amendments of Castlegate II. If this summary differs from the restrictive covenants, the difference is unintentional, and is not an amendment. The restrictive covenants control.